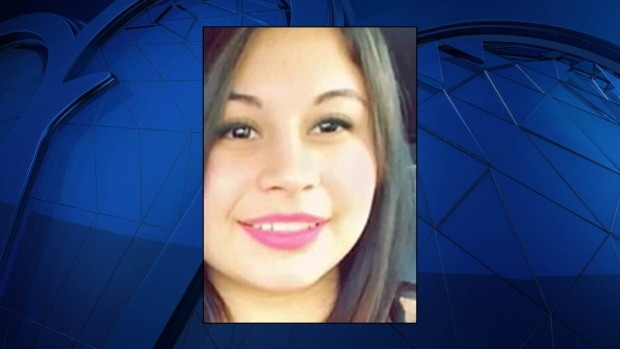 Police believe that human remains recently found near an industrial park in Fairfax County, Virginia, are those of a 15-year-old girl who went missing from Montgomery County, Maryland, two months earlier. Alexandra Reyes of Gaithersburg was reported missing Dec. 10. On Saturday, more than 30 miles south, Fairfax County police found a body they believe was hers. A medical examiner ruled the death a homicide and determined the victim suffered trauma to the upper body. Police said Reyes knew people with gang affiliations. A 17-year-old girl she knew is missing and believed to be in danger. Remains found near a Virginia park are believed to belong to a Maryland girl who had been missing more than two months, authorities said. Detectives believe the victim is Damaris A. Reyes Rivas, 15, of Gaithersburg, Maryland. She was reported missing Dec. 10, 2016. Reyes' devastated mother spoke about her daughter on Tuesday at her home. "My daughter was a good person -- not because she was my daughter, but because she was truly good, sweet. She got along with everybody," her mother said in Spanish, asking that News4 withhold her name for her safety. Reyes' mother said her daughter told her that MS-13 gang members began to threaten her at school. In late November, just after Alexandra turned 15, she left home. She stayed in touch with her mom and eventually returned home. Then, on Dec. 10, she left again. “She told me, 'No, Mom, I want to see you, but I can't return,'" the teen's mother recalled. "'Why?' I asked her. "No, Mom, I can't tell you.'" She heard from her daughter for the last time on Jan 6. The body was found on the 7100 block of Wimsatt Road in Springfield as police searched for a missing juvenile. The investigation by police in Fairfax and Montgomery counties is ongoing. Five people are in police custody. Police did not confirm whether they believe suspects have ties to MS-13. Police said they do not believe there is any threat to public safety. Two other teen girls who police say had contact with gang members have recently gone missing in Fairfax County. One teen returned home safe; the other is still missing. "Multiple overlapping investigations" are underway, 2nd Lt. Brian Gaydos said at a news conference Tuesday afternoon. Lizzy Colindres, 16, and her 5-month-old baby, Aiden, returned home to Springfield after they were missing for nearly a month. Police said they believed the teen mom and infant were in danger. They were seeking the child's father, who police said had gang ties. Venus Romero Iraheta has been missing for nearly a month, police said Tuesday. She left home after receiving threats from gang members, according to police. Iraheta knew Reyes, police said. Reyes' body was found not far from the neighborhood where Colindres lives. Reyes mother cried on Tuesday as she spoke about her daughter. "She was a little girl. Barely 15," she said. Anyone with information on Reyes' case is asked to call Fairfax County police at 703-691-2131, reach Crime Solvers online here or text a tip to CRIMES (274637). Any texted tips should contain "TIP187" in addition to the message. Stay with NBC4 and NBCWashington.com for details on this developing story.